La Aurora’s newest release, Black Lion, comprises four different blends: Black Lion Connecticut, Black Lion Cameroon, Black Lion Corojo and Black Lion Maduro. 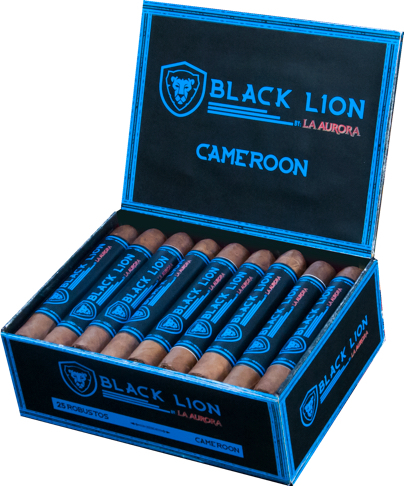 "Black Lion Connecticut features a Connecticut wrapper, wrapped over an Ecuadorian binder, and fillers from the Cibao Valley, Nicaragua and Peru…"
"Black Lion Cameroon sports a Cameroon wrapper, wrapped over an Ecuadorian binder, and fillers from the Cibao Valley and Nicaragua. Wooden and Cocoa notes, hints of cinnamon…"
"Black Lion Maduro features a Cubra wrapper, wrapped over Brazilian binder and fillers from Cibao Valley, Brazil, Nicaragua and Peru. Citrus notes, cocoa, cedar…"
"Black Lion Corojo sports a Corojo wrapper, wrapped over an Ecuadorian binder, and fillers from the Cibao Valley and Nicaragua. Honey and floral notes." These new cigars will be available in four vitolas (each packaged in 25-count boxes): Robusto (5 x 50), Churchill (7 x 50), Toro (5 1/2 x 54) and Gran Toro (6 x 58).